Republica Files Flood victims rest in make shift tents in Itahari in this October, 2017 file photo. 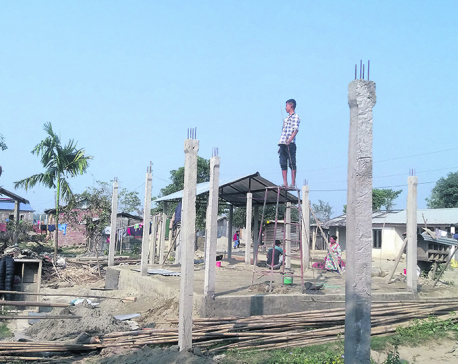 ITAHARI, April 2: Eight months ago, several villages of Itahari were severely affected by floods that killed nine and left over 500 people homeless. In the immediate aftermath of the flooding, the victims started living in school and other community buildings. 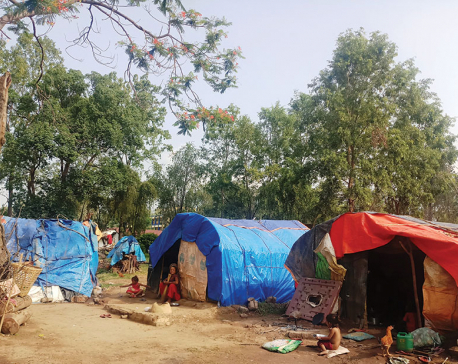 Later these victims were shifted to makeshift tents with a promise of funds for building their house by government and non-governmental agencies. Though another monsoon is just around the corner, most of these flood victims are still homeless. “When floods wreak havoc, life is thrown out of track. Getting life back on track is especially hard for poor people like us. It gets even worse when the government pledges support but does not deliver it,” said Anuja Nepali, a flood victim. “It's been nearly a year now that we became homeless. Still the government has not taken measures for fulfilling its promise of building new house for my family,” she added. “The relief amount has been already released for distribution to respective ward offices. So far, we have not received updates on the status so it's not possible to provide the exact details. But, it's under process,” he said. Though the District Administration Office has asked for updates on the status of relief distribution, the Office of Municipal Executive is waiting for updates from the ward offices along with the receipts. “Though distribution of the relief amount to the victims has taken time, other relief materials were distributed to them on time. We have been assisting the flood victims in every possible,” Adhikari claimed. Flood victims like Nepali do not buy Adhikari's claim. She says that the local body has not helped flood victims like her in any way. A local of Narsingh Rural Municipality, she shared that since being hit by the flood she has been living in a hut with her small children as she lacks the means to get back to her land and erect a new house. “The flood completely damaged our house, rendering us homeless instantly. Not only our house, but also even our piece of land was totally swept away by the flood. If you visit the land, where our house stood earlier, you will realize that the land is no more suitable for building house or growing crops,” she added. 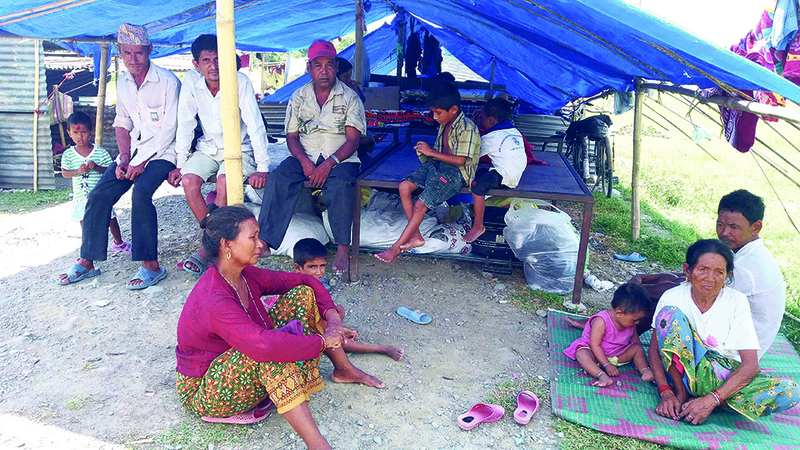 Hundreds of flood victims like Nepali are living miserable life in and around jungle areas. Their children have stopped going school and most of the children and elderly get sick most often. In lack of proper sanitation and nutrition, among other basic needs, these victims suffer from several health problems. During the winter, most of them suffered from fever, cough cold, Nepali shared. “Considering the way our plight has been neglected, it feels that we are stateless. It seems that the government is in place only for the welfare of the rich people, not for the welfare of poor people like us,” she lamented. Post flooding, the loss from the flood to the district was estimated to around two billion rupees. According to Nepali, many of her villagers lost their cattle and assets, apart from their residence and lands to the floods. “We lost everything we had to the flood. It washed away everything we had put together our whole life. Compared to what we lost, the government's relief package was nothing. It hasn't provided that too till now,” she fumed. When the local bodies were elected, flood victims like other voters were much elated. They hoped that the elected representatives would take serious note of their plights and would take necessary actions to move things faster. However, Nepali feels that their hopes on the elected representatives, also turned out false. Defending the long time it has taken, Adhikari blamed it on the lengthy bureaucratic process. “It is a lengthy process from releasing the funds to distributing the funds to victim families. Since procedures are to be followed, things cannot happen in a day,” he said. “All the flood hit villages have been provided with assistance, and we are helping the victim families in every way possible. We admit that there is still room to do a lot,” he said further adding that, “We are also worried about the situation of the victims and trying to do our best,” he added. Soon after the floods, the government had distributed rice, oil and salt to the victims. That lasted for few months. Several NGOs and other bodies had reached out to the victims with clothes and other assistances. Even though it is the duty of District Administration Office to keep track of the assistance provided, it does not have all the details. “We have been following up with the local bodies time and again but have failed to get the records,” said the district CDO Anuj Bhandari. “We hope to get them all soon,” he added.